We offer the most unique service anywhere in the Greater Los Angeles area, Exterior House Detailing! We will rinse your entire house with ULTRA CLEAN DEIONIZED soft water that won’t leave any water spots. It’s like having a SPA TREATMENT FOR YOUR HOME. We will wash off your siding, shutters,windows, framing, awnings, and gutters to make your house look better than new! 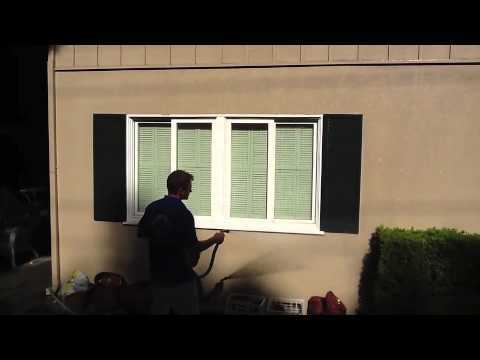 Then we will wash all your Windows, sills and frames,light fixtures and outdoor patio area. We will finish by washing off your patios and balconies, washing your windows and making your house look like a new paint job! Thus your entire house will be detailed and clean to perfection. Next, we can offer Glass Restoration to those old windows making them look new again. We can also put a special treatment on glass that helps them stay cleaner longer too! We use 5 different ingredients in our patented Franchise solution that’s been proven for 30 years to get your windows cleaner and keep them cleaner longer for you! whoah this blog is excellent i love reading your posts. Stay up the great work! Please advise your blog address so w can see what you are doing before we approve. That’s right were going to first power Wash all your siding, stucco, wood work to get ail the dirt, dust, and mold off your siding.